Until February, 2003, all of our inter-island passages had been only day-sails or at most overnight passages. 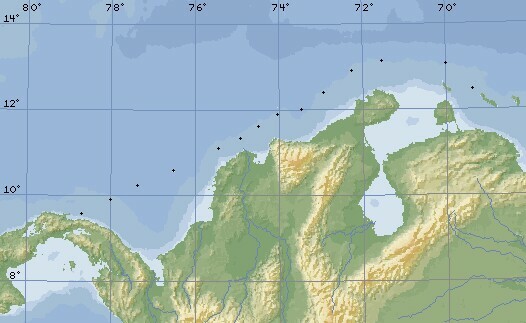 When we left Curaçao for Panama (more specifically, the San Blas Islands) we were facing a 700-mile passage which we estimated would take about 100 hours. Because this was our first "real" passage, we thought you'd like to know what it was like and what each of us thought about it. Note that you can also read the newsletters we emailed back as we were on this passage. These have a bit more immediacy and reflect our thoughts and feelings at the moment. 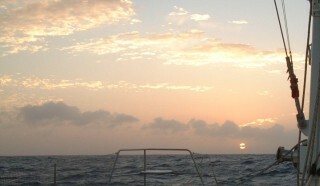 (Sue) I have been looking forward to multiple days at sea ever since we got on Ocelot. Since my first sailing experience was setting out from Africa in 1981 I've always loved the time on the open ocean -- those days of endless blue, the routine of watches, the variety of sunsets, moonrises, moonsets and sunrises. But I wasn't kidding myself that this one, through the Caribbean Caldera (my name for the Southwest Caribbean), would be a sleigh-ride. Jon and Chris and I had crossed this same stretch of ocean in 1987 in Oriental Lady, and had been hammered and sometimes scared by the huge seas. The passage itself was a study in patience, perseverance, skill, and nerve. I learned that the kids are willing and able sailors. They took their watches without grumbling or fussing even when awakened in the middle of the night. They both were steady on the helm, in the galley, and as companions while I was on the wheel myself. Chris was especially good with the radar and learned to communicate by VHF radio with the passing ships. 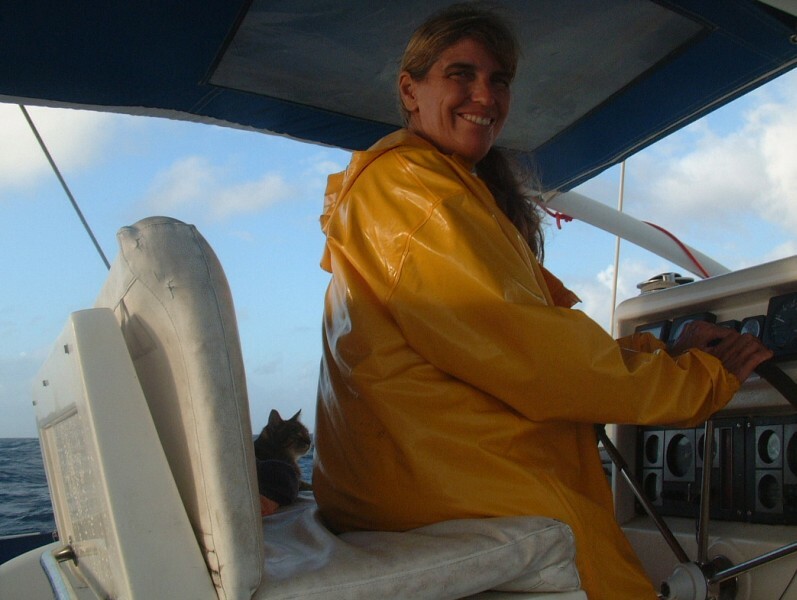 Amanda was invaluable as a "spotter," calling out wave heights and directions when conditions got pretty radical and the helmsman had to concentrate on the steering, not be looking over a shoulder to see the next wave train or rogue wave behind us. From what we hear (and hope) the conditions in the tropical S. Pacific are much more mellow. (Jon) I sure hope the South Pacific's more mellow. Sailing at night is often a stressful time for the Captain, as I've got to be on call and prepared for all contingencies all the time (like being woken up to find us being run down by nitwit freighters in the pitch dark while it's blowing a gale). Paradoxically, I find I don't really sleep much for the first 3 days or so of a passage. So I much prefer day-sailing and then hanging out for a few days exploring. Passage making is for 747s (best upwind craft ever invented), but sometimes it can't be helped. It was delightful to have the kids on watch with me. In fact, it turned out that we had some great conversations. But my favorite may still be "Land Ho!" Our autopilot was nonfunctional during very nearly the entire trip, so we always had somebody who had the sole duty of steering the boat. Since we were standing watches, and any one of us was on watch with another person half the time, we decided that the second half of our watches would be spent on the helm. This meant that four times in a 24 hour day, we would each spend 1.5 hours trying to maintain the boat's course and dodge any waves that would splash or spray us. Not a real enjoyable time! 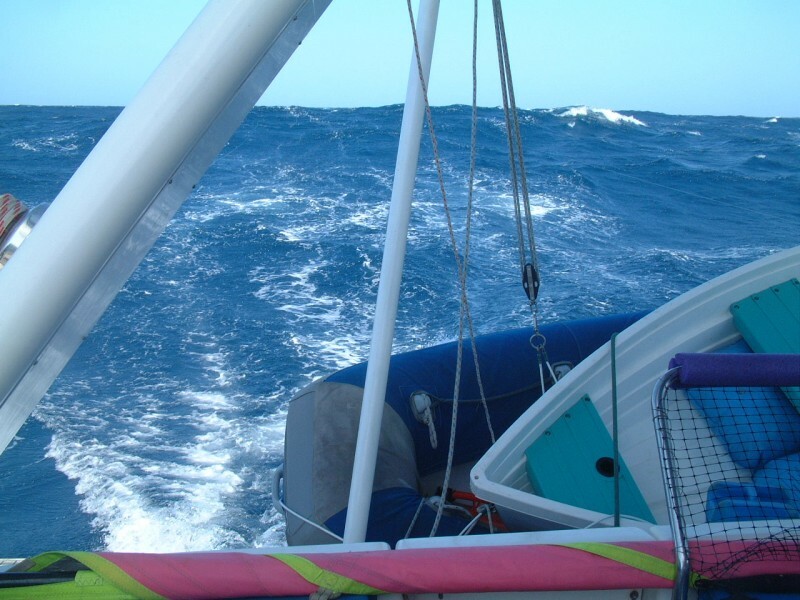 The boat was actually fairly calm at first, but it got a lot worse by the third day, when we moved into some rough and confused seas. By then, I was just getting used to the moderate motion we'd had until then. The rougher seas made any kind of reading impossible, and basically just made everybody uncomfortable. Similarly, the trip was fairly dry until the third day. Then, it was a matter of as soon as you came on watch, you put on foul weather gear, and whenever you went off, you toweled dry. Getting soaked just does not make for a pleasant sailing experience. Actually, there was wind all trip, but since we were running with it, there wasn't much apparent breeze at the very end, and for a long time, there was so much wind, we had to roll up a lot of our sail. Also, the wind and spray meant that any exposed skin (like your feet) got really cold while on watch. The last one definitely did not happen. Our longest sails until then took less than 24 hours, and I had considered a ten hour sail to be a long one. This passage took more than 90 hours (about four full days) without a stop, and completely out of sight of land for much of that. Not fun at all. 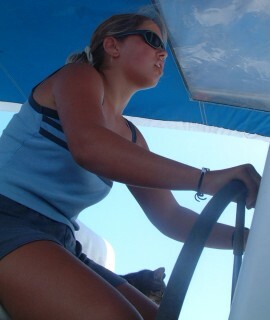 (Amanda age 13) On our two overnighters before this long trip, I didn't mind sailing at night so much. On one it was a just-past-full moon, and the other it was waning at about a quarter. But both of those were calm seas, and only one night. In other words, I got enough sleep and could laze around the next day as much as I needed to. This one was a bit crazy. Like most people, it took me about two and a half days to get my "sea legs," and before that I was taking one, maybe two Stugerons (seasick pills) a day. Those things are magic. But anyways, if you want to know about the boring normal things that happen on every sail, you can read the other peoples' pieces. Me, I'm going to write about something that never happened on Oriental Lady, and has now happened once (and only once, happily) to us. And that thing just happens to have the indelicate name of "being pooped". Now, that is not when you finish in the head and then it gets plugged up and floods the boat. Being pooped is when you get "water over the poop deck." In other words, when a wave breaks into your cockpit instead of the sea. But let's tell the story from the beginning, shall we? 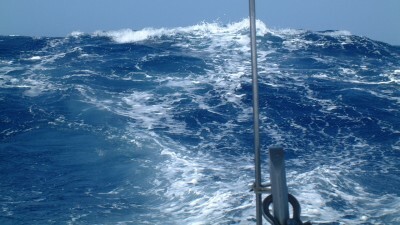 It was about noon on our third day, 15‑20 foot seas, and more than 30 knots of wind. 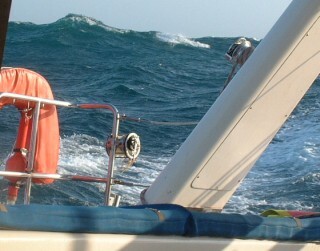 We had discovered that the easiest way to go over the big waves was to have one person spotting and telling the person on the helm what to do to get stern-on to the huge swells. We'd say if it was a big one, moderate, or what we called a "potato field," which is just lots of confused little lumps. So my mom was on the helm, and I was spotting. Now, we've found that Ocelot rises to waves easily, but this one we didn't quite get on top of in time. It was the third of a series of three 20 foot swells, and I, sitting on the starboard (windward) side of the cockpit, looking aft, saw it peak and just the very top of it turned white. At this point, it was just at the height of our solar panels (about 12 feet above our nominal waterline). We rose a bit more, so it was between the dinghies and the panels, and then it broke. But I didn't see that - as soon as I saw the top curling, I yelled "WET!!!" and swung down into our companionway (the doorway to the inner salon), turning my back to the oncoming water. I had never before thought of how powerful water can be. But now that I think of it, once the wind starts making swells break, they've got to be going fairly fast. I was standing in the doorway when the water hit me, and it propelled me four feet forwards until I hit the counter, and would have kept pushing me had nothing been in my way. I felt the cushion I had been sitting on slide down the steps after me. I imagine this must have been a bit of a shock to my dad, sitting inside reading his book. I mean, I come shooting down the stairs, followed by this wall of water that flies at him, hits the bulkhead, and splits to run down into the two hulls. Luckily, we have annoying bulkheads that we have to step over to get into the cabins, but they stopped the water from going further than that before draining to the bilges and getting pumped overboard by the bilge pumps. After the water stopped pushing on my back, I looked at myself. My back was soaked completely through, and my front was just as bad. "Holy..." I said, staring out at the sea again. Luckily, after the big series was a long potato field. "I take it we got pooped." My dad came up behind me, the driest of us all, and took a quick scan of the cockpit. "Out of the way, Manda!" he yelled, running out there. I wondered what was going on until he went aft of the cockpit, something we really try not to do while sailing, and I looked out and noticed - there was no starboard davit line hanging down to hold up the dinghies. Not good... So Chris and Dad went back there and tried to lift both of the dinghies up, while they were being repeatedly filled and emptied of water. Later, I was glad that we had put extra support ropes on, but at the time I was sort of dithering around, trying to pick our chain buckets up that had fallen over and spilled chain all over, and meanwhile being available to get stuff for Dad and Chris. As it turned out, the sudden extra weight of the water had broken or slipped the shackle holding the clip to the pulley system. Dad fished the hoist cables out of the dinghy, and sent me down to rummage around in a drawer looking for shackles. Once we got the shackles set up, it was easy to pull it up and support it again. After all that adrenalin, I sat shivering outside for about fifteen minutes. I couldn't look at the oncoming swells for about 20 minutes. I am very very happy that the wind eventually died down and we had an okay night. And I have learned something about passages - boring is a good thing.